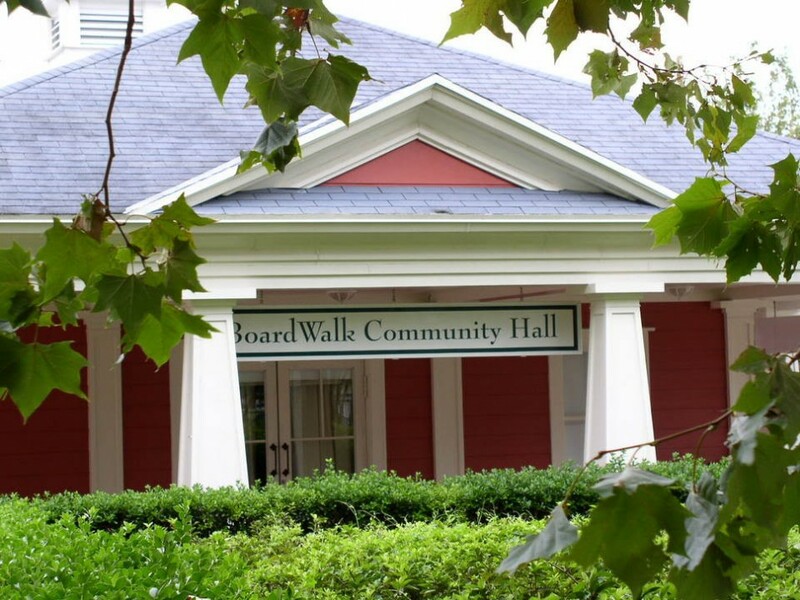 Having stayed at Boardwalk Villas (BWV) more than 40 times, I learned some interesting and (hopefully) helpful facts and tips during my time spent there that I would like to share with our readers. 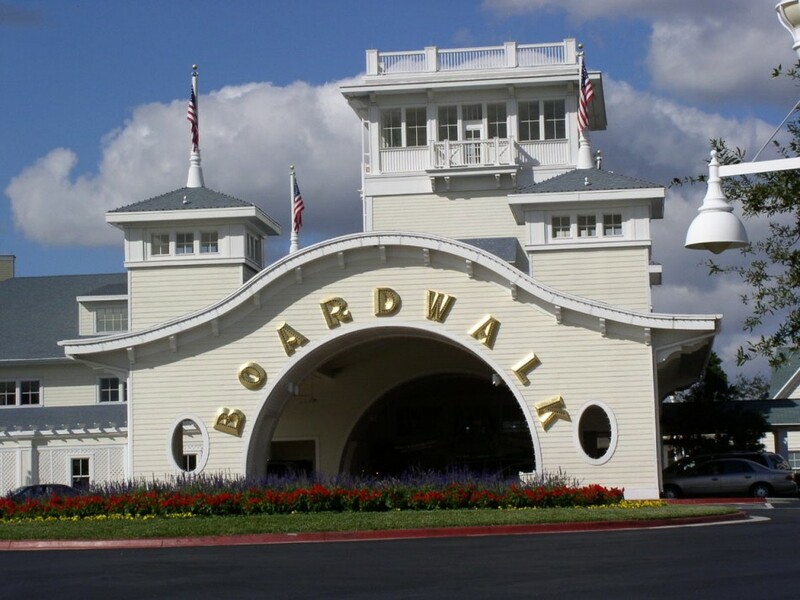 Boardwalk first opened in 1996 and was the first resort built to be both a DVC resort as well as a deluxe “regular” hotel (known as Boardwalk Inn). If you enter the lobby from the parking lot, the Villas are to the left and the standard hotel rooms are to the right. 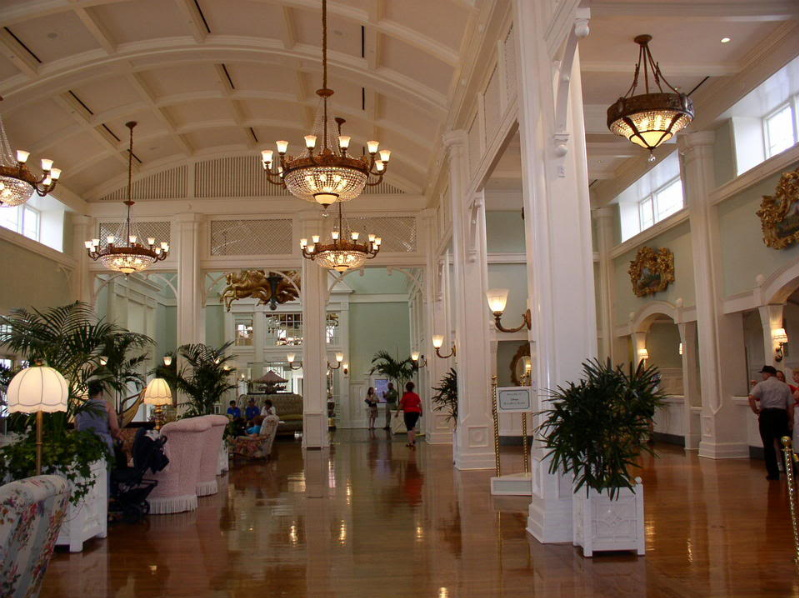 The main lobby is where you check in for both resorts. This article is going to concentrate on the BWV part of the resort, but most everything applies to both the Inn and the Villas. Before you arrive at BWV I suggest you utilize the online check in. 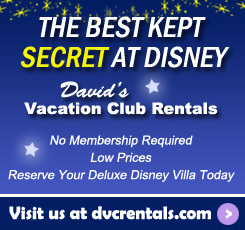 This will make the process easier when you get to the resort. When you approach the entrance from the parking lot, look for Cast Members (CMs) with clipboards standing out front. These CMs will often approach you, but if not, don’t hesitate to tell them you are there to check in. If you’ve taken advantage of online check in previously, there is a chance you won’t have to go to the front desk at all. The CMs with the clipboards will likely have all of your information, including room keys, ready for you. Rooms are promised to be ready at 4PM, but still check in upon arrival even if you are earlier. Your room might be ready early (always a bonus), but if not, a CM will take your cell number and text you when the room is ready. If your room is not ready, bell services will be happy to store your luggage so you can enjoy yourself elsewhere until the room is prepared. As you look around the lobby you will see BWV is themed to an old seaside amusement park, mostly reminiscent of Atlantic City, NJ and Coney Island, NY. There are paintings of early 1900’s amusement parks, old time penny movie machines, a miniature horse carousel (TIP: Hidden Mickey on the rump of the pinto horse! 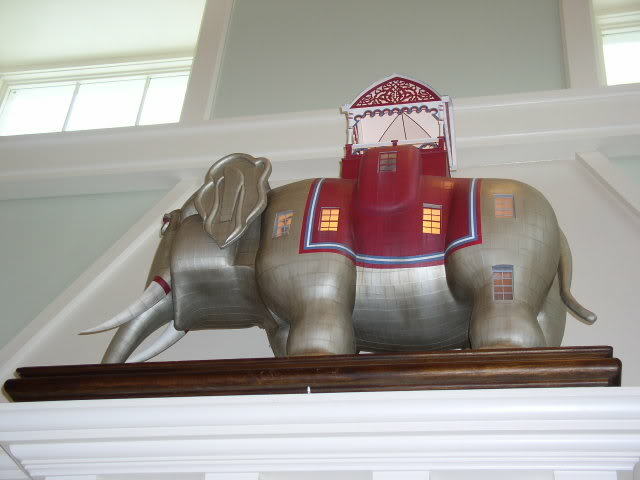 ), a replica of an Elephant shaped hotel that actually existed in Atlantic City and gorgeous horse paintings over the registration area. There are large chandeliers and huge chairs and couches to sit and relax on. There is also a small merchandise shop just off the lobby. 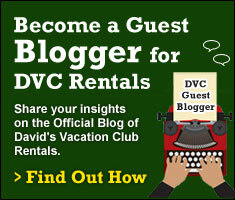 This is where you can buy DVC and BWV merchandise and limited souvenirs. You can also find stamps, aspirin, needles, thread and toothbrushes here—little necessities that you might have forgotten. When you’re ready to venture out into the world there are buses to take you to Magic Kingdom, Animal Kingdom, Downtown Disney or either of the Walt Disney World (WDW) water parks. To get to Disney’s Hollywood Studios (DHS) or Epcot you have two choices—a boat (known as “Friendship”), or you can walk. The walk to Epcot is under ten minutes and the walk to DHS is about 15 minutes, depending on your pace. The boat to Epcot takes about the same time as walking. You will enter Epcot through the “back door” known as the International Gateway. This entrance is usually less crowded than the main entrance to the park. The boat to DHS takes about twice as long as walking. This is because the boat stops at Beach Club and Swan/Dolphin resorts on the way to DHS. Each time the boat docks/unloads/loads it takes time. TIP: If you do take the boat, walk across the small bridge that is just past Jellyrolls piano bar (more on Jellyrolls later) on the boardwalk. In five minutes or less you will be at the Swan/Dolphin boat dock and DHS will be the next stop. When you return from DHS do the same thing—disembark at Swan/Dolphin and walk over the bridge back to BWV. This will save you about 10-15 minutes of time. Of course if you don’t mind waiting or you enjoy the boat ride, stay on! Personally I enjoy walking and the path to DHS (without using the boat at all) is one of my favorite walks in all of WDW. It is almost always devoid of people and it is a peaceful relaxing stroll from BWV to DHS, often with views of wildlife on the way (water birds in the lake and bunnies on the land). If you do take the boat be sure you get on the right one. 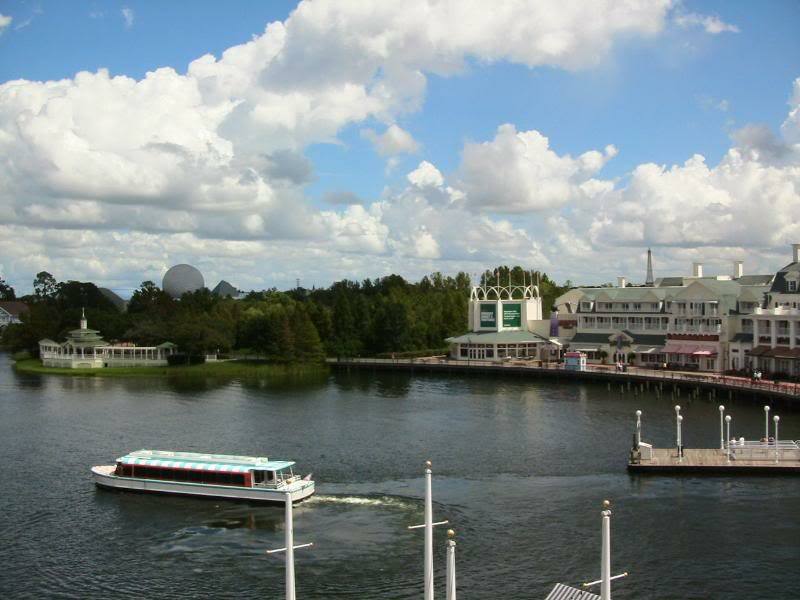 The boat dock is located on the Boardwalk, the right side boats go to Epcot and the left side to DHS. If you’re hungry there are a virtual plethora of eateries to choose from in the area. TIP: There are no restaurants inside the resort, but in the morning you can find pastries, muffins, coffee and juice at Boardwalk’s bar, the Belle Vue Lounge, located on the Inn side of the resort. By the way, the Belle Vue is a lovely lounge, complete with overstuffed couches, chairs and a large selection of adult beverages (in the evening). There is a balcony off the lounge, and you can choose to enjoy your food and drink outside with views of the lake and boardwalk. 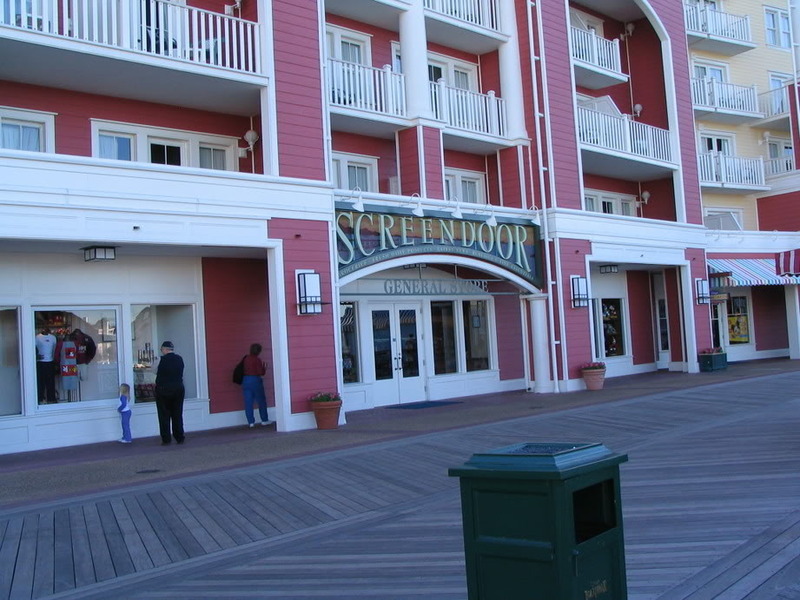 Outside the resort, on the boardwalk, are a number of places to eat. Not all of them are open all day, so be sure to check before making your decision. They are all located outside of the resort, on the boardwalk itself. 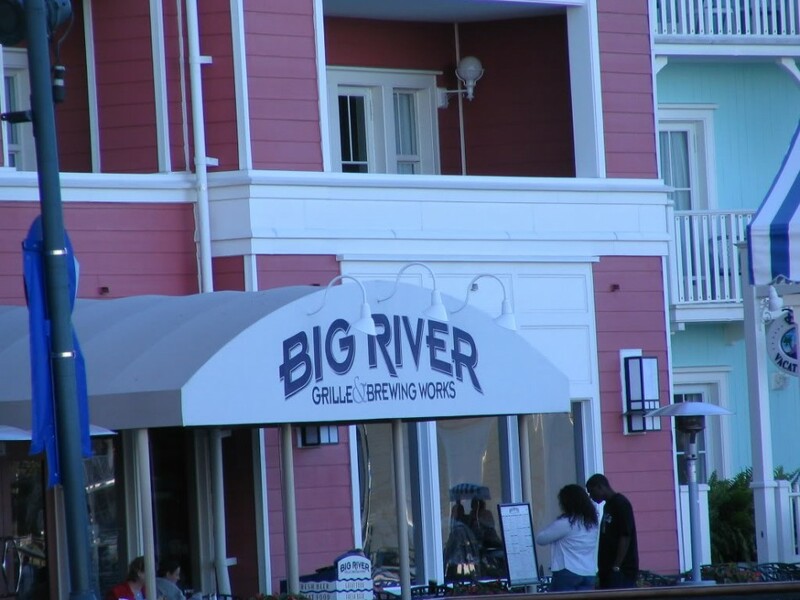 Full service options include: Big River Grille and Brewing Works (they brew their own beer here! 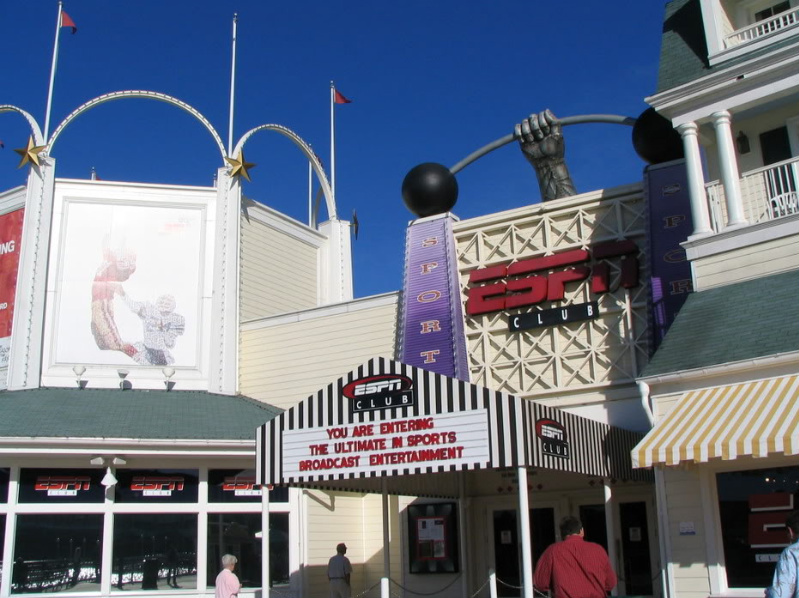 ), ESPN club, Flying Fish Cafe and (the newest addition to the boardwalk area), Trattoria al Forno. All of the restaurants are beautifully themed. There are also a number of food kiosks on the boardwalk, selling a variety of different items. These include fries, sandwiches, pizza, funnel cakes and more. 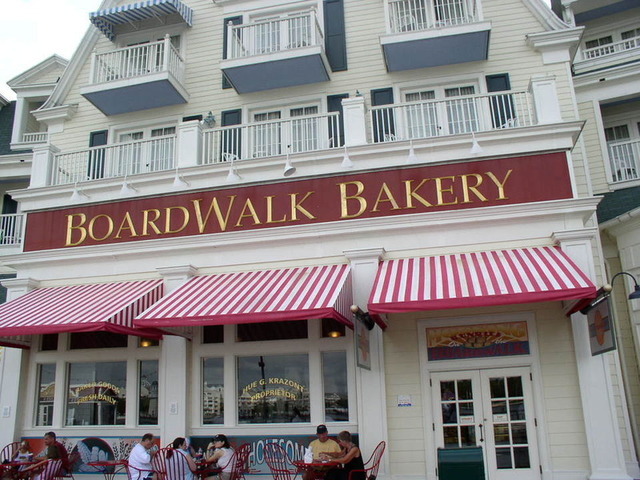 Another excellent option is the Boardwalk Bakery. Along with dozens of tasty desserts the bakery stocks a number of sandwich items, both hot and cold. TIP: Buy something from the bakery the night before so you can have it ready in your room the next morning for breakfast. This saves time if you’re trying to get to a theme park early. If you’re in the mood for something sweet, look no further than Seashore Sweets. They sell ice cream, candy, and fudge. As a fun FYI there are photos of former Miss America winners lining the walls. 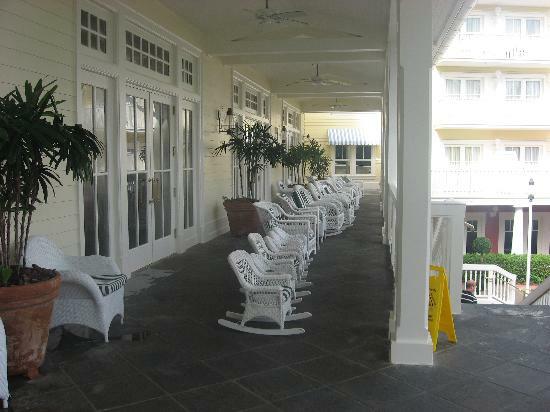 But we can’t forget that when you stay at BWV you are also steps away from the Beach Club, Yacht Club, Swan and Dolphin. These resorts all have their own restaurants and exponentially increase your options for dining in the area. TIP: Located in the Dolphin Hotel, Picabu is a cafeteria style restaurant that is reasonably priced and has a wide variety of food options. It’s the only eatery in the boardwalk area that you can get a full meal (breakfast, lunch or dinner) and never need a reservation. I consider it a hidden gem. There are a number of fun things to see and do right on the boardwalk. These include a pin cart, face painter, caricature artist, hair wrapping and a self-service booth where you can pose and make custom post cards. There are also a number of shops to browse and/or buy merchandise. The Screen Door is the place to shop if you’re looking for food to cook in the room, bread, milk, frozen items or snacks such as chips or pretzels. The other stores have more traditional theme park merchandise and souvenirs. Another entertainment option in the Boardwalk area is the Fantasia Gardens Miniature golf course. Fantasia Gardens is located by the Swan and Dolphin resorts and it’s a short walk from BWV (you can also take the boat towards DHS and get off at the Swan/Dolphin dock). There are two courses. One is an imaginative fun course made for all ages, themed on the movie Fantasia. The other course is more challenging and geared towards adults. It is like a “real” golf course but built on a smaller scale. There are 18 holes and you will find sand traps, water hazards, and bunkers at this course. There is a fee for mini golf. Community Hall is a nice bonus for guests staying at BWV. Located by BWV’s quiet pool, there is no charge to take advantage of video games, foosball, ping pong, coloring and most other activities. You can also rent free DVDs to watch in your villa. There is an activities board by the hall. Most of these are free but some have a small charge. Standard bike rentals are available here as well (fee). 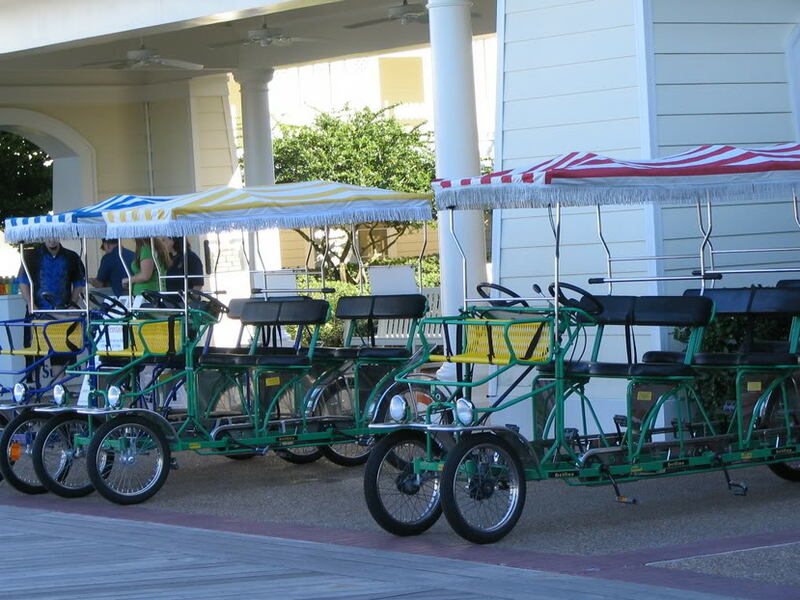 But if you’re in the mood to bike with the whole family, head back to the central area of the boardwalk. Here you will find surrey bikes to rent (fee) that hold up to 6 people. TIP: Be sure to peddle with a LOT of energy to make it up the hill on the way to Beach Club. I have seen more than one family get out and push the bike up that hill. There are two pools at BWV. As already mentioned there is the quiet pool near community hall. There is no lifeguard here and the pool has no slide. It is heated, and there is a hot tub. I have found that generally that hot tub is less crowded than the one at the main pool. 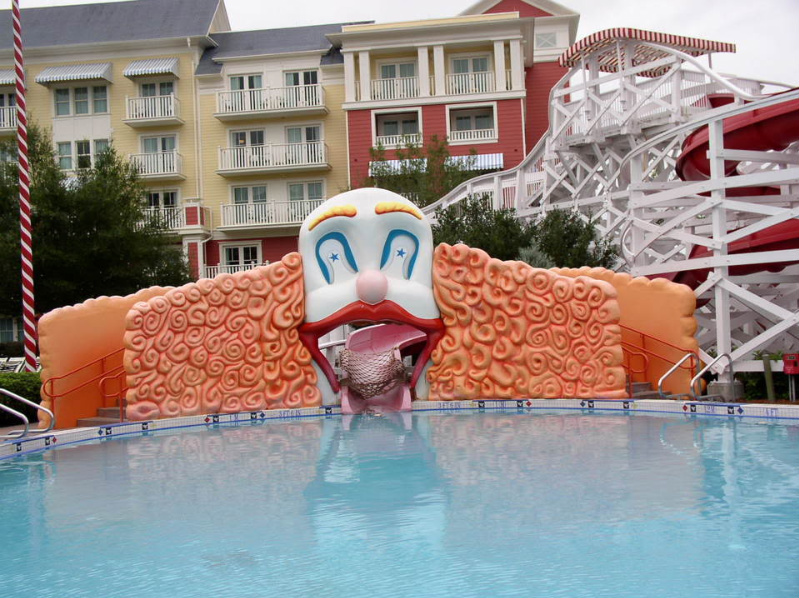 The main pool does have an awesome slide, you exit the slide through the HUGE mouth of a clown that’s painted onto the slide (some people find this a bit creepy). TIP: When you head to your room and go to the elevator, look down to check out the cool rug—there are footprints of Minnie, Mickey, Goofy and Pluto in there. The carpets in the hallway also have many hidden Mickeys, as do the small lights on the walls just outside the elevators. When night falls there is free entertainment on the boardwalk. It runs from about 7-10 and there are magicians, jugglers, acrobats and more. Most have very clever acts and make you laugh while they amaze you with their tricks and talent. There are usually 3 or 4 different acts per night and each puts his/her show on four or five times per night. They often pull participants out of the audience, so be careful to stay back if you’re shy or you may find yourself part of the show. TIP: If the weather is bad, check inside the BWV lobby. Often, the entertainers can be found here during inclement weather. There are also midway games on the boardwalk where you can win a prize. These games have a fee, as does the small arcade that is located near the pool area. Also in the evening, you can enjoy “dueling pianos” at Jellyrolls piano bar, where you can request songs and sing along with the other patrons (there is a cover fee, currently $12, but no drink minimum). Every so often the people working there make the whole audience stand up and join in a dance (they instruct you as you do it). Jellyrolls is a lot of fun with a very good vibe. It is especially great if you have a group of family and friends to enjoy it with. 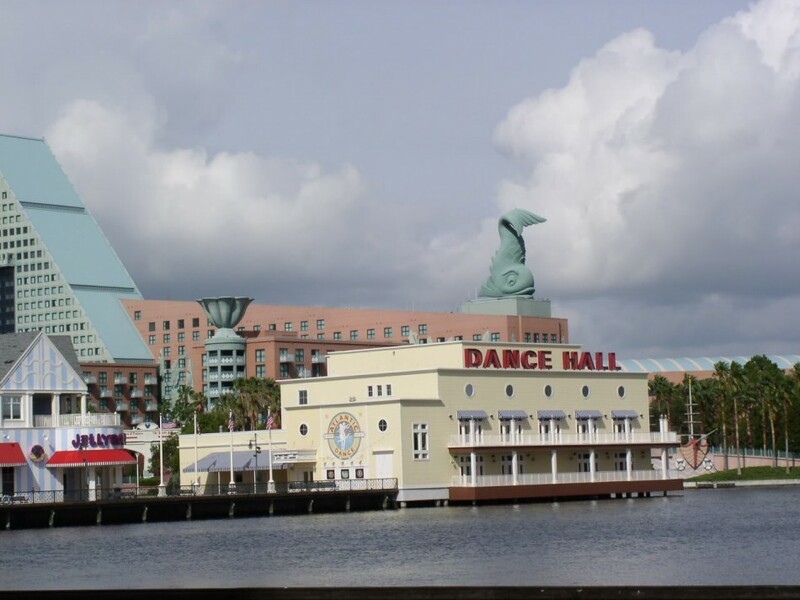 If you’d rather dance than sing, next door to the piano bar is Atlantic Dance Hall ($5 cover charge, free for DVC members). Both Jellyrolls and Atlantic Dance Hall are open very late, generally until 2AM. (BTW, you must be 21 years of age and over to enjoy both these establishments). Jellyrolls is open every evening, Atlantic Dance Hall is not always open so be sure to check at the front desk if you want to visit. TIP: Once you have checked in be sure to see where the nearest “exit” door in the hallway leads you. Boardwalk is shaped in such a way that often the elevator is NOT the closest way to get to your destination. 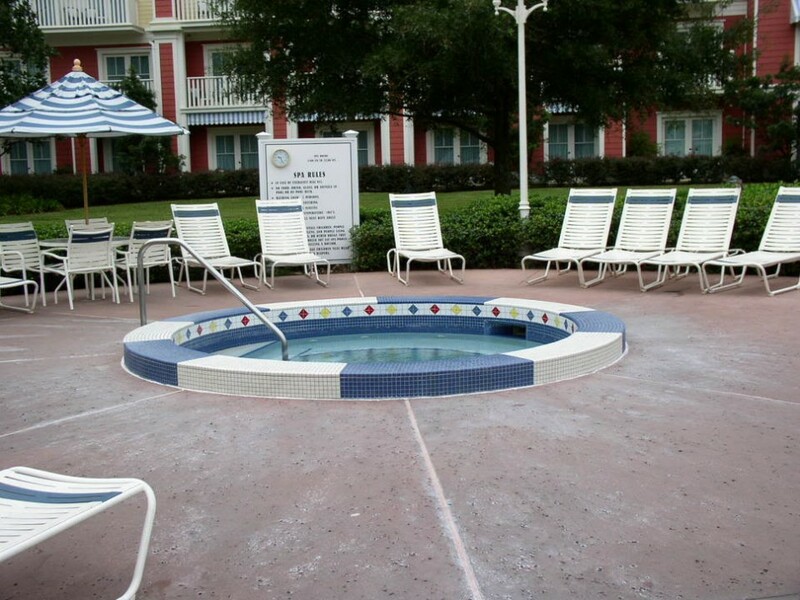 For example if you choose to walk to DHS, the pathway is near the quiet pool. If you happen to be on that end of the resort, walking down the steps and out will get you to the path to DHS (as well as the quiet pool and Community hall much faster). If you’re looking to work out or get a massage look no further. BWV has the Muscles and Bustles health club, located on the first floor of the resort. There is a fee for a massage but there is no charge to use the exercise equipment. 25 thoughts on "All About Disney’s Boardwalk Villas"
Let’s just skip the parks and hang out at the hotel. Our home since 2000. Love it! 16 days until we arrive here! Dedicated bus to MK would be great! Love the Boardwalk and it’s easy access to Epcot and Hollywood, but always felt that the bus should be direct when you pay the higher price for the Deluxe Resorts. We stayed at Art of Annimation and they had a MK and Epcot bus that went direct! 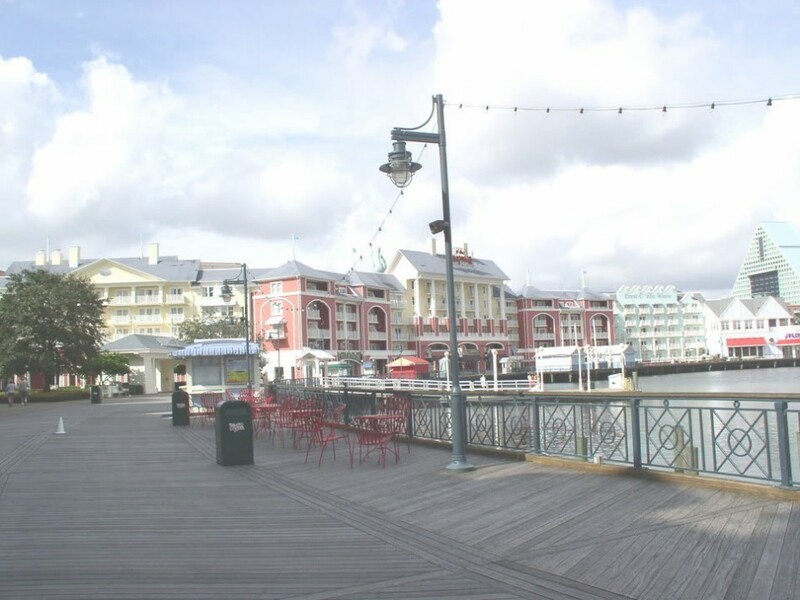 If it wasn’t for the bus transportation to and from the Magic Kingdom, the Boardwalk would be a perfect resort. When we were there last month, we were told BWVs/Boardwalk Inn now has a dedicated bus to the MK, no sharing with other resorts! Love the Boardwalk, one of my DVC “homes”!